GRIMSTON, Sir Harbottle, 2nd Bt. (1603-85), of Gorhambury, Herts. 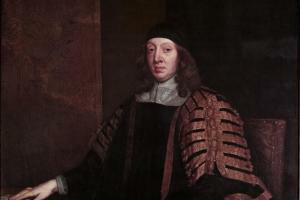 Speaker of House of Commons 25 Apr.-29 Dec. 1660. Ere we got into the House ... they were seated (as they had contrived), and Mr [William] Pierrepont had named Sir Harbottle Grimston for Speaker, and they were conducting him to the chair before many others were come into the House. would not bind the King. He has had some experience of this mischief. There is as great a mischief in the length of this Parliament as if there were no Parliament. A standing Parliament is as inconvenient as a standing army. 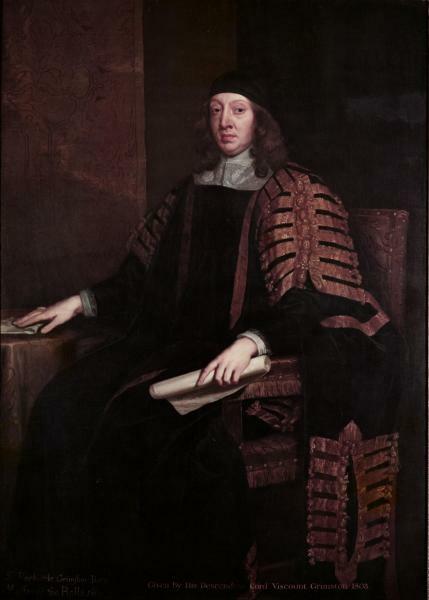 After the prorogation Sir Richard Wiseman advised that the lord chancellor should ‘conjure’ Grimston and his son, and when Parliament met again he weakly rejected the opposition contention that it had been automatically dissolved by the long recess. Nevertheless Shaftesbury accorded him the tepid rating of ‘worthy’. On 20 Feb. 1677 he opposed the building of 30 warships ‘till, like wise fathers in the case of children, we could tell whether we were able to support and keep them’. He is against giving either supply or grievances the preference. He is for going the old Parliamentary way, hand in hand. ... But people’s purses will not be opened without redress of grievances. He may say that we have grievances, and heart-aching ones too. ... We must strengthen people’s hearts before we can lighten their purses. He finds in this bill that there is an engrossing and appropriating the administration of this list to be given the King by the bishops exclusive to the Commons and peers of the realm. This power in the bill to the bishops is not in our power to give. It has been said that Parliaments are omnipotent; but as great as that power is there are things not in the power of Parliaments to give away. I think this pardon is void in several respects and therefore needs no bill for revocation of it. ... If this be admitted that the King can grant pardons thus, it is to no, purpose to complain; our mouths are stopped with a pardon. 3. Morant, Essex, i. 464-5; Essex Rev. v. 203; Trans. St. Albans and Herts. Arch. Soc. (1933), 68. 4. S. Dale, Harwich, 222; SP44/335/241; Essex RO, 35/101-26; T/2/26; Harwich Charters (1798), 57; Foss, Judges, vii. 100; CSP Dom. 1637-8, p. 507; 1639, p. 57; 1680-1, p. 182; HMC 10th Rep. IV, 507-10; A. E. Gibbs, Corp. Recs. St. Albans, 7, 85. 5. CSP Dom. 1648-9, p. 277; CJ, vii. 849. 6. Vis. Essex (Harl. Soc. xiii), 205-8; Morant, i. 464-5; Keeler, Long Parl. 198-9; D. Underdown, Pride’s Purge, 147; Trans. St. Albans and Herts. Arch. Soc. (1933), 68. 7. Bramston Autobiog. (Cam. Soc. xxxii), 114-15, 116-17; Clarendon, Rebellion, vi. 215; CJ viii. 1; CSP Ven. 1659-61, pp. 140-1; CSP Dom. 1659-60, pp. 429-30; Old Parl. Hist. xxii. 263-7, 317-19; Hatton Corresp. (Cam. Soc. n.s. xxiii), 43; State Trials, v. 986; Burnet, ii. 76. 8. Bramston, 119; CJ, viii. 265; Burnet, ii. 76; HMC Verulam, 56, 68; HMC Heathcote, 170-1. 9. CSP Dom. 1675-6, p. 341; Grey, iii. 322, 341; iv. 66, 110-11, 177, 284-6, 337-8; vi. 379-80; Pepys Naval Minutes (Navy Rec. Soc. lx), 296; CJ, ix. 391, 399; EHR, lxvi. 46-47. 10. Grey, vi. 409; vii. 61, 175-7; Luttrell, i. 324; Burnet, ii. 76.